Yes, absolutely. I have been working at the Hungarian Meteorological Service since 2002. For the first few years I mainly dealt with legal issues (for the police and courts), and between 2005 and 2018 I worked as a researcher. Since last September I have been mainly working in service development. If I remember correctly, I joined the Hungarian Meteorological Society – Magyar Meteorológiai Társaság (MMT) in 2001. Because I was born in the summer, mostly I like the beautiful summer weather. In addition, I love thunderstorms, perhaps because in summertime I often saw them on the shore of Lake Balaton when I was a kid. I don’t really like cold, windy, rainy weather. I could say I am an active member. From 2011 to 2014 I was the organising Secretary in our Society and between 2009 and 2014 I performed the secretarial duties of the Agro and Biometeorology Section of MMT. Since 2014 I have been working as the Secretary General, and am already in my second term. Our Society offers numerous programmes for members. I really enjoy our biennial congress. At these events, besides professional presentations, there are also possibilities for informal discussions. In addition, whenever my time permits, I participate in the lecture sessions of various fields. 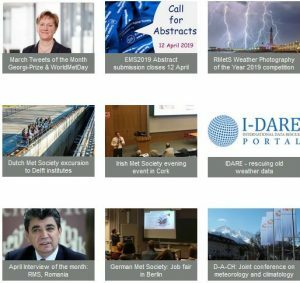 Until now we have not organised any webinars or other online courses or events, but perhaps in the future we will move in this direction as well. We were very pleased to host the EMS Annual Meeting in 2018. This was a big challenge for us, even though most of the organisational tasks were done by EMS and Copernicus GmbH. This may have shown that Hungary and Budapest is an excellent venue for any professional conference. We are planning to organise more international conferences and training courses in the future. Another important goal is to promote our Society and meteorology to the public. We are constantly looking for opportunities where we can show the beauty of meteorology to children and to draw their attention to the problem of climate change, for example. It’s almost impossible to choose a single event… but I’ll try. Visiting the HDF Pápa Air Base (the Main Operating Base of the NATO Strategic Airlift Capability programme) was very interesting from the perspective of aviation meteorology. members are notified directly about any meteorological events in Hungary. Generally we use email to inform our members of all national and international events (conferences, training, workshops, etc.). In addition, our website and Facebook page provide important sources of information. 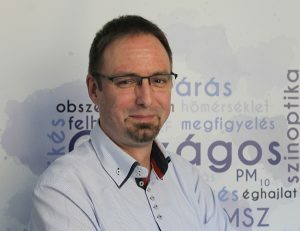 Major events are reported in “Légkör”, the joint journal of MMT and the Hungarian Meteorological Service. We publish our programmes on our Facebook page. Sometimes photo albums or the presentation material are uploaded there also. Overall, we use this platform actively. At the same time, we are not present on other social media platforms. This is mainly due to the fact that communication (and any other organisational activity) is carried out by volunteers. I think that EMS is very helpful regarding the flow of information at European level and it makes our work easier. Job offers and information on conferences and workshops are available on the EMS website. I always read news from EMS member organisations; it is good to see how others respond to today’s challenges. In my opinion, this activity should be pursued and possibly strengthened. EMS could play a greater role in organising European or regional conferences or workshops, in addition to the EMS Annual Meeting.